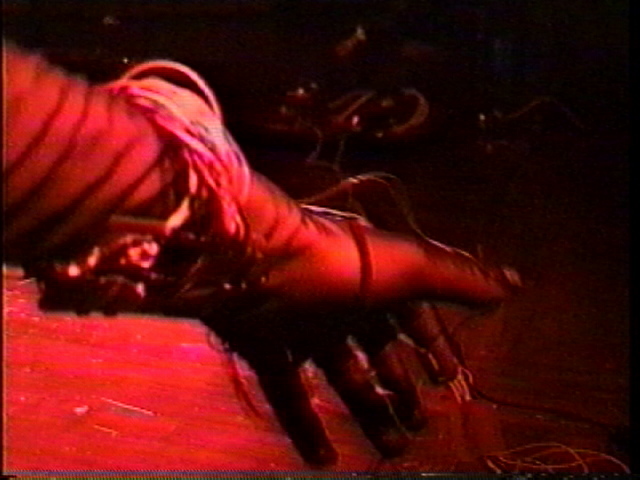 Laetitia Sonami built her first gloves in 1991 for a performance at the Ars Electronica Festival (Linz) with Paul DeMarinis, entitled "Mechanization Takes Command", these were a pair of rubber kitchen gloves (the perfect housewife's tools) with five Hall effect transducers glued at the tip of the fingers and a magnet on the right hand: by touching the fingers on the magnet, signals were generated and fed to a Forth board which converted them to MIDI signals. These signals then were fed to various synthesizers and samplers. The current glove was built by Bert Bongers in Den Haag, Holland, in 1994 and sponsored by STEIM Institute, Amsterdam. It followed the design of the previous glove and greatly enhanced the look and performance, thanks to Bert Bongers. The same sensors are sewn on the top of a thin black mesh, arm-length, lycra glove tailored in Paris. The glove can be covered if desired, by other gloves of various color patterns to match one's cloths and moods (but this is never done). Added to the five microswitches, four Hall effect transducers, pressure pad, resistive strips and two ultrasonic receivers are a mercury switch on the top of the hand and an accelerometer which measures the speed of motion of the hand. STEIM's Sensorlab conditions the signals and converts them into MIDI which is fed to a G3 laptop. MAX-MSP software (Cycling'74) is programmed to map the sensors to a variety of sound parameters. The mapping and sonic material changes in each composition. In some compositions, MIDI is sent out to control hobby motors and/or lights through a Basic Stamp. A new version of the lady's glove is currently being worked out. The intention in building such a glove, was to allow movement without spatial reference (there is no need to position oneself in front or in the sight of another sensor), and to allow multiple, parallel controls. Through gestures, the performance aspect of computer music becomes alive, sounds are "embodied", creating a new, seductive approach.